When I was asked by my friend and colleague, RoseAnn Janzen to write about what it’s like to be intuitive AND an entrepreneur, I had to think before I decided if I wanted to share about this. It hasn’t always been easy for me to open up, not just because I’m an introvert but, because throughout my life when I did share my experiences I was told I had an overactive imagination or I was made to feel this was wrong. After thinking it over, I realized it was important to share even if it pushed me out of my comfort zone. You see, being intuitive is what led me to become an entrepreneur in the first place and find my purpose. I’m happy about the result and I think sharing my experience might inspire other budding intuitives and entrepreneurs to follow their instincts too. No one believed me when I said there were people in my room at night who spoke to me. I had to deal with this from the age of 4 and I was very frightened by my nightly visitors. This caused a wicked fear of the dark where I had to sleep with a night light on until I was in my twenties. My mother didn’t believe that I wasn’t just repeating gossip about an alcoholic neighbor when I told her he died of “liver disease.” I couldn’t tell her the “voice who talked to me” had told me ’cause I knew she wouldn’t believe me. So by the age of eight I had decided that it was best not to share what I saw and heard. This began a long stretch of keeping a part of myself hidden and many, many years of self-doubt. Did hearing voices mean I was crazy? Was I making this all up? Was I a “bad girl” as implied by my mom? Being doubted by my mother seriously undermined my confidence and led to my making many disastrous decisions because I didn’t trust myself. It was not a bed of roses to have this ability. 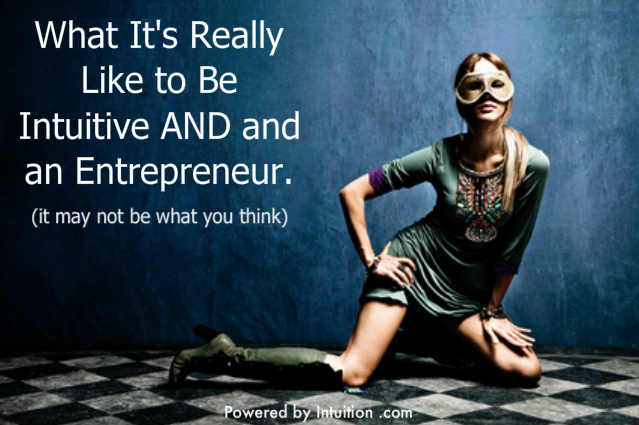 It’s pretty much the same when it comes to being intuitive AND an entrepreneur. I let that “voice” guide me and I listen to it. It says things such as, “tackle this project, read this book or call this person and take this course or go to this event” and I do. When I’m working at my desk I sometimes hear my cat Punkin on his scratching pad even though, he’s been gone now over a year. It’s just another day at the office. Once when the voice spoke very loudly my now ex-husband was standing nearby. Out of the clear blue I heard this command, “Go into the mortgage business!” I jumped when I heard it. My husband seeing me jump said, “What’s wrong?” I asked him if he’d heard anything and he shook his head, no. I’d always wondered if anyone else could hear it and finally I had my answer. I listened, left the world of wealth management behind and went into the mortgage biz for 15 years where I had a very successful run during the real estate boom. Sometimes, I hear things when I’m around people. “They lost a baby” or “She’s addicted to pills” and such. Sometimes I see things such as the image of a character from a movie super-imposed over a person’s face or body and I know that something similar to what happened to the character from the movie is going to happen to this person. This is difficult because often I have to ignore it. It’ll happen when I’m out somewhere, for example on the grocery check-out line. This produces a lot of anxiety; am I supposed to say something? What if I don’t and something bad happens or what if I do and they think I’m crazy? The bottom line is if there’s some opening or it’s appropriate to help I do but I never invade anyone’s privacy out in public. As soon as a person knows about my ability they become very inquisitive too, which I totally understand. Human beings want answers, and I get that. Being constantly asked, “Do you see anything around me? Is there anyone here? Do you hear anything? Can you tell me anything?” is quite overwhelming. You don’t feel like you can just have a normal conversation with people because they’re expecting you to be Zolar the Magnificent. I have a dear friend who’s a medium too and she goes through the same thing…wherever she is people are constantly ask her to “do her thing.” This is another reason why it’s been difficult coping with this and I’ve tended to shy away from being more open about it. I can’t always control when the voice speaks nor what it tells me. I can only assume when it speaks I’m to listen. There have been many times in my life when I wanted guidance and I got it wrong or it didn’t come. It’s not like I can put a quarter in and out pops the answer although, I wish it were. Now I can look back and see this was due to what I have learned and teach others; I was much too fearful and attached to one particular the outcome. That blocks intuition from coming through all together or you misinterpret it as what you want to hear. Now, I ask, wait and try to stay neutral about the outcome. A few years ago, after the real estate bubble burst and I wasn’t making enough money I was contemplating whether to take a salary job or hang on in the mortgage business until I had finished producing my guided meditations album. As I locked the front door to take a walk I was thinking, “If I find a coin it means I should hang on and finish the album.” I started walking my usual route when the voice said, “Go left.” But I didn’t want to go left! That was the long way around and I only had a short time for my walk. I obeyed and went left. A block later I found a twenty dollar bill on the street. I took it as a huge sign to hang on and finish the album and I’m glad I did. When I was younger I heard the voice more frequently especially as it pertained to other people, until I learned to take charge. In my twenties I read somewhere that you could say, “No! You don’t talk to me unless I say it’s time!” So that’s what I did and continue to do and it got much better after that. Now I hear the voice more often advising me about my own life – which is fine and what I teach people to do: use their intuition to guide them. I’ve trained the voice not speak to me about other people’s lives unless it’s an appropriate time and place…but it does break the rule every so often. The biggest impact being intuitive had on me was that it led me seek answers about life’s Big Questions from an early age and to begin doing yoga and meditating as a teenager in my quest for those answers. I was very curious about death and what came afterward. I knew that there must be more to life because of the people in my room at night but, before the Internet there were meager resources to get information. I scoured the public library taking out the few books I could find on spirits or telepathy. As I got older I amassed a huge personal library of books on the metaphysical topics I was so fascinated by. 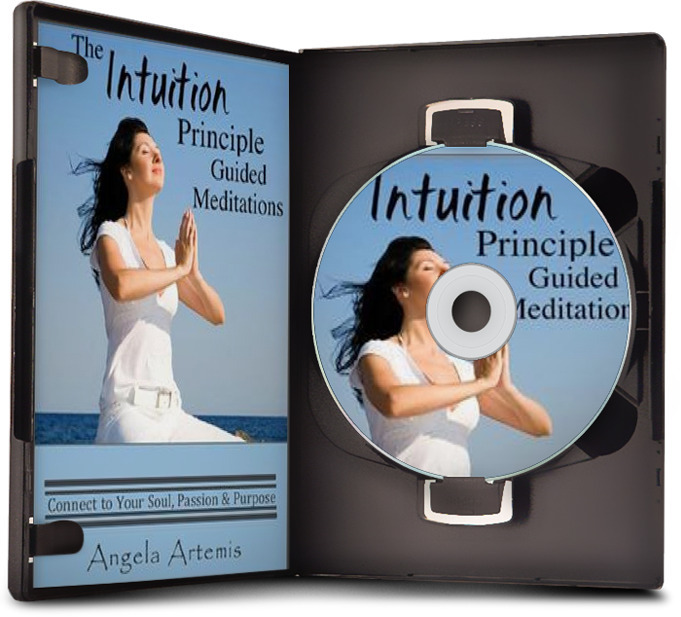 My search for answers took me on a journey that led me to eventually found Powered by Intuition in 2010. Powered by Intuition began as a “dare” I made of myself. As an adult because of my lack of confidence in myself, I’d ignored my intuition many times and made many poor decisions in favor of what seemed “safe” or what I thought I was supposed to do. As a result I woke up one day very, very dissatisfied with my life. I had a hunch that if I were to listen to this inner voice rather than giving my power away to the outer voices of authority figures my life would change. I decided to do an experiment with my life. Since up to this point not listening had put me on the “wrong” path I decided from now on I would do the opposite and make every decision by following my intuition instead. And, I would see what happened to my life by doing that. At that point I felt I had nothing to lose. The result of this crazy experiment was that I experienced many amazing synchronicities which led me to write “The Intuition Principle” in 2011 and to eventually become a full time entrepreneur. Listening to my own inner guidance bolstered my confidence so that I finally hit my stride. Since then I’ve gotten used to living what I call “an intuitively inspired life.” Personally, I now think it’s the most exciting way to live even if coming completely out of the intuitive closet is still something I struggle with. I sometimes feel like two different people…the creative intuitive and the rational business woman but I’m finally getting closer to integrating the two. 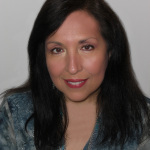 Being intuitive helps me in my life and business to be more positive because I know for sure, we are always being helped by our connection to Infinite Intelligence/higher self/soul/guides (I honestly don’t think it matters one bit what you call this intelligence). 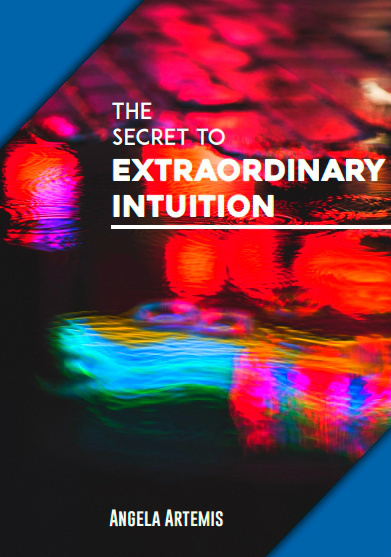 If you’ve been a reader of PBI for any length of time you know that I also believe that intuition is the intersection of creativity and genius. 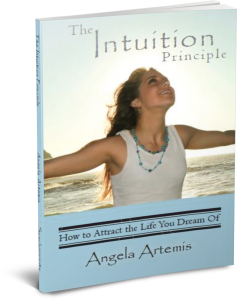 Intuition is where your most original and inspired ideas come from. It’s how we become thought-leaders. I believe that the most creative people are also intuitive and that’s why I think it’s an important ability to develop—to solve problems. Listening to intuition builds confidence and that leads to becoming leaders and being better at solving problems. We will never solve the world’s many problems unless we use intuitively inspired thinking. That’s my soapbox and that’s why I do what I do. I want to lift people from feeling insecure and afraid to expressing their true power so that they can step up and help make the world a better place. We’re here to contribute to humanity and to do that we must learn how to become creative problem solvers. If you read “The Intuition Principle” you know I don’t think of intuitive ability as “entertainment” in fact, I bristle at that. Intuition is an under-valued human sense that can change the world and could stop the destruction of our planet because it is the greatest sense for fostering empathy. When you have empathy you cannot destroy life, you feel your “oneness” to it. The lack of empathy is why we humans are killing our own habitat. If you were to “tune-in” you would feel the pain of the conscious life force that’s screaming…so we rationalize to cut ourselves off from tuning in. We need more intuitively inspired leaders with the empathy to lovingly steward our planet and who unite humanity not divide us. Each of us is always being guided and whether you are an intuitive person or an intuitive entrepreneur you have access to the guidance of Infinite Intelligence as well. Your intuition is the technology that makes it possible to tap into Infinite Intelligence. Always know that, trust it and know you are capable of doing great things. Don’t doubt that voice like I did. Start listening and you’ll find you meet with more fortunate coincidences and become much more self-confident and more empowered and, as you do your life will get better and your accomplishments will get bigger. You’re potential is unlimited and you do have all the answers inside if you just begin to trust that voice and follow it. May you live with passion and purpose on your journey to your own exciting intuitively inspired life! This post is part of a series on this topic inspired by RoseAnn Janzen of Reveal Your Life. Follow the series and read the next post….here. If you enjoyed this article please share it with a friend on Twitter, FB or G+. Thank you! Do You Feel Uncertain Making Decisions? The Women Speakers Association Rocks! Brilliant article Angela. Thank you for sharing so honestly. It’s wonderful to hear someone else speaking so sanely about ‘the voice’ which I also experience, but funnily enough have never called intuition. However it has led me to all sorts of things, big and small, and most lately has been the guiding force in terms of my work, which is turning out to be quite different from what I thought it would be! And so much more clear, fulfilling and inspiring too. Wow, Angela, you really nailed it. When we are tuned in to more layers of consciousness it can be really tricky until we learn how to manage what we are getting. I am so glad you shared this. More and more children are being born highly attuned and I think we need to support them and teach them how to handle it so they can use this for the greater good and not squash it down and be made to feel bad about it. Thank you for inspiring us with this great topic. It really got me thinking and I have you to thank for it. I’m honored to be included with all the other great entrepreneurs who are also intuitive in this blog hop.